The ride to Heron Island from Gladstone on the Heron Islander was nothing short of a spectacle when a pod of blowing Humpback whales crossed our paths. We were at perpendicular routes, with them migrating along the coast. These enormous deep blue creatures were surfacing and lobtailing to exhibit their beauty as they blew short bushy breaths into air. Our ferry came to a halt to give way to the family, and of course ogle at their magnificence. Early autumn each year whales migrate north from the cold winters of Antarctica and it is likely to spot them here both from the launch and from the jetty of the island. If you are interested in learning more about where these whales go- I found this site informative. There are three ways of reaching this island. The launch takes 2 hours between Gladstone and Heron Island while the sea plane and helicopter take about 30 mins from Gladstone Airport. For those interested ,I found the the schedule here. You could spend the evening watching the sun set over the ocean as it changes filters on the sky in shades of pink, purple, and orange- either at the beach or at Bailey’s bar with a glass of drink in your hand. You can check the sunset/sunrise timings beforehand to plan your trip ahead. Check with the information centre first thing as soon as you land on the island for the schedule of the tours the next few days of your stay so that you can book ahead. The paid tours need a prior booking while the complimentary ones, you can simply join in. The island is simply the tip of the iceberg. Delving deeper into the Heron reef for an hour inside a semi submersible, covering only a small distance of this 2,40,000 sq mtrs reef, let’s you into a whole new universe of marine life out there! Coral Trouts, Yellow Trumpet Fish, Eagle Ray, Porcupine Ray, Sea Green Turtles, Black Tipped Shark, Boulder Corals and Plate Corals were just some of the marine life we saw on the tour. Whether it’s high or low tide, you can always lurk about the underwater world. Reef walking amidst a maze of corals is possible for several meters or even kilometres at a stretch, with aquatic life increasing in number and colours as you go deeper. The vivid, brilliant colours of the corals and fishes seen while snorkeling is unbeatable, hands down! Not to mention the experience of moving alongside rays, reef sharks or sea turtles! I was lucky to be able to spend the longest lunar eclipse of the century on Heron island! While the ocean shimmered enigmatically under the dazzling moonlight, the dark clouds were in a mood to spoil the party. I hit the sack wondering if I’d miss the blood moon after all. But more often than not, our disappointments are more imagined than real. Rushing to the jetty as soon as I woke up, I couldn’t take my eyes off the sky where the moon veiled in red, shone; casting it’s soft glow on the wreck of the HMCS Protector, like a spotlight, almost as if she knew it’s significance. There are guided snorkeling and diving tours where you’ll be taken to dive sites from where you can snorkel all the way to the jetty. I found the tour and hiring costs here. The Heron Marine centre, where snorkeling equipment can be hired closes by 4.30pm and opens after 7am. It’s best to carry your own equipment if possible. Prescription snorkels are also available here though I simply wore my contact lenses inside a regular snorkel, and it worked out just fine with a well fitting snorkel. If you are a novice then you can choose to snorkel from the shore, but stay close since you are unsupervised. There have been a couple of deaths reported in the past (not to scare you, but remember, safety first!). Watch the timings of the tides (that’s always put up outside the information centre). You can start reef walking a few minutes before the low tide starts to get maximum time in the water. Be ready to return swimming if you get late. Don’t forget your aqua shoes for reef walking. The dead corals and stones can be real sharp. Not to mention you may accidentally come in contact with poisonous stonefishes. If you see a Cone, stay away, they can be poisonous. It’s important to not touch anything under water. Sea cucumbers are plenty and can get in your way while reef walking. Some of them can be slightly buried under the sand. Be careful not to step on them. They can also expel toxins if they perceive threat. The most often used route for reef walking is right across the information centre, straight ahead as far as you can go, being mindful of the tide timings. During high tides you can expect reef sharks and rays to be swimming very close to the shore where you can walk, swim or snorkel. The Black Tipped Sharks tend to swim away when they see humans while the Epaullete sharks approach you but they are harmless. So keep your underwater cameras ready! Nevertheless, try not to corner them as they have the potential to cause injury, even if it’s self defence. 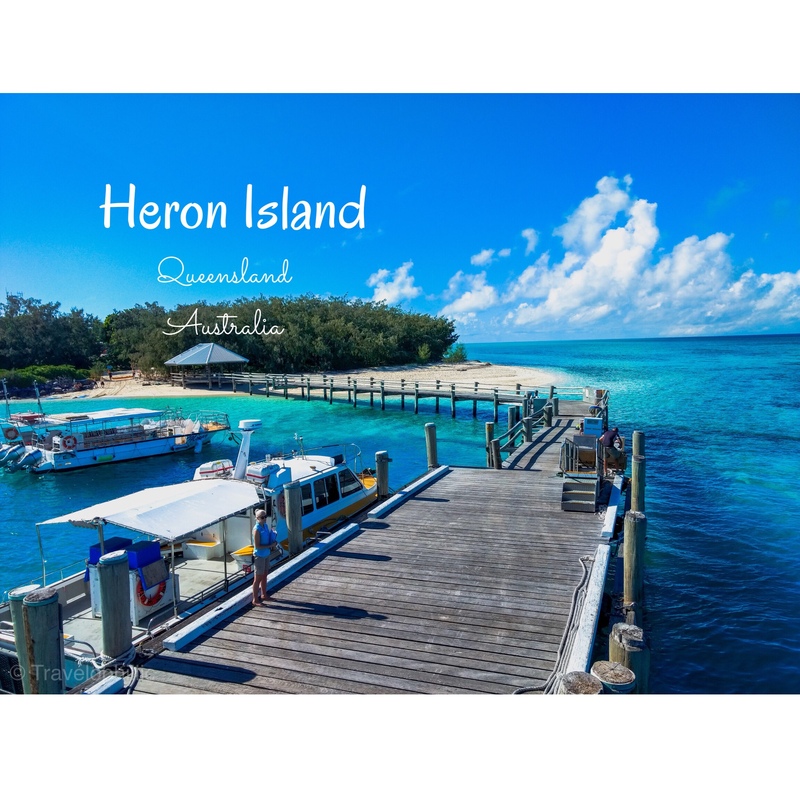 There’s only one resort on the island, the Heron Island Resort, there’s not much choice there. Costs start from 347$ AUD per night depending on the rooms you choose . The only restaurant available here serves a minimum fixed 2 course meal costing $45 per head. Food from outside is not allowed. Facilities for preparing tea and coffee are available in all rooms. Boat transfer costs $128 AUD per head both ways . Watch out for local offers and discounts at the Gladstone Information Centre. Watch this video 🎥 to get a virtual tour of the island! I’d love to hear your thoughts and experiences below, in the comments section! Very nice, but the hotel is a bit expensive. I agree with you. Unfortunately there are no camping or other stay options here, so it’s a price you pay to see this beautiful place. Very comprehensive introduction to what sounds like an amazing place. The hotel price from $347AUS is roughly what you would pay a medium sized double room in a 3-4 star hotel in London without breakfast. Thanks Murray! Good to know how things work in London, thanks for sharing. I hope to visit the city someday. Looks absolutely divine. And how lucky to catch the blood moon there.